W. Bro. Raghavan Prakasam was born in Thiruvananthapuram 8th May 1954. After taking a degree in Veterinary Science from the College of Veterinary and Animal Sciences, Mannuthy, Thrissur, he pursued his ‘Management Studies’ with Indian Institute of Management, Bangalore and Leeds University U.K. Presently Dr. R. Prakasam is the senior most Professor of the Institute of Management in Government. He has 30 years of experience in Management Consultancy, Teaching and Management Training. Successfully done various consultancy assignments for various institutions in the State and outside the state. One of the major consultancy was with Orissa Health and Family Welfare Project, funded by DfID, UK. Instrumental in developing Regional Centre at Calicut and Executive Training & Development Centre at Thiruvananthapuram. Developed an one year PG Diploma Course in e-Governance in collaboration with IIITM- K.
Wife Dr. V. C. Valsa is an Associate Professor in Zoology. Blessed with two children. The elder is Dr. Vineetha Prakasam, now doing her MS in Ophthalmology with Trivandrum Medical College is wife of Dr. R. Suryanath M.D. The younger, Vivek Prakasam, an Architect from College of Engineering Trivandrum, is now doing specialization in ‘Advance Construction Management’ with National Institute of Construction Management and Research, Pune and soon will be joining M/s Jones Lang LaSsalle India. W. Bro. 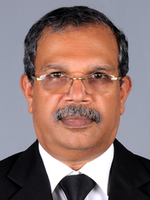 R. Prakasam joined Freemasonry on 21st May 2005 in Lodge Trivandrum No.168. He made steady progress in freemasonry by the regularity of his presence and the advancement he made in the Masonic knowledge. He was awarded certificate of merit while acting as Junior Deacon, Senior Deacon and Junior Warden in the Ritual Working Competitions. He is a Founding Member of Lodge Sabridesam No. 374. He is second Assistant Sojourn in Holy Royal Arch Chapter Trivandrum No. 125 and is also a member of Holy Royal Arch Chapter Thiruvananthapuram No. 92.